We arrived in Sapa by night train (easily the most luxurious one so far!) and found our minibus for the hour long ride through the mountains to arrive in town. 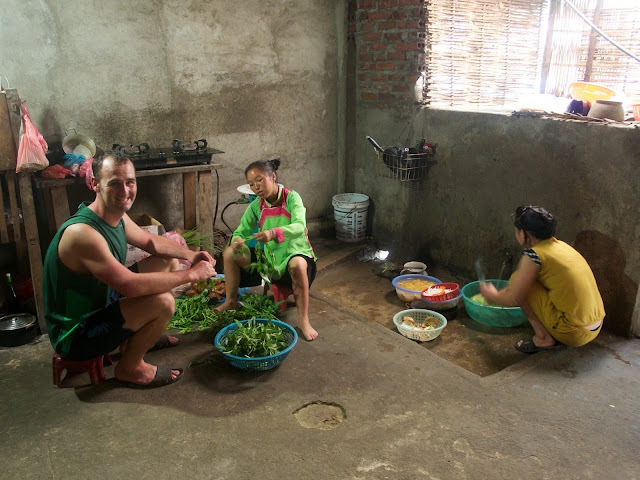 We had thought Sapa would be the northern Vietnam version of Dalat, but it's WAY BETTER! The town is much smaller and more charming, and because we are smack dab in the middle of a valley full of different ethnic tribes, the people (and what they're selling) looks so different. 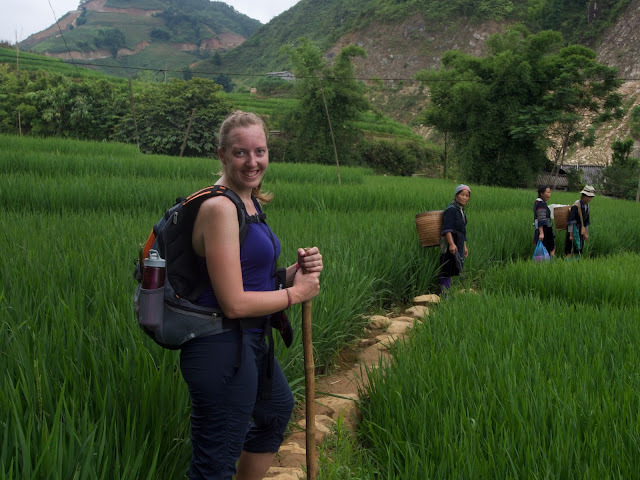 The most popular activity in Sapa is trekking around the mountain (Mt Fansipan, or "Fancy Pants" as we've taken to calling it) and through the villages and rice paddies of the valley. So, we got on board with the rest of the tourists and signed up for a two day trek, with a night at a homestay in the valley in between. 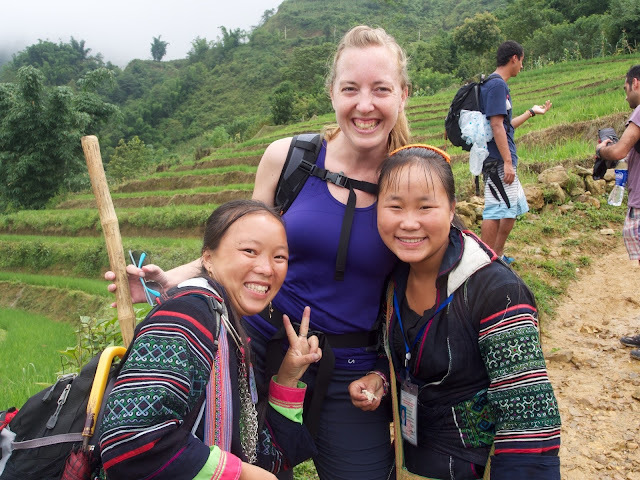 We met with Chai, our guide for the trek, and were immediately charmed! She is a 21 year old Black Hmong woman, who has never left her village, Lao Cai. She had great English, all of which she learned from tourists and facebook (!). As we walked, she told us all about Hmong courtship and marriage rituals (only the men get a say, and most couples get married around 13 years old), beliefs about death (she believes she was reincarnated from a chicken, as her mom says she talks too much) and travel (she has never left this valley, and hopes she can travel in her next life). Our hiking path was unorthodox to say the least. We had heard from other travelers that it can get muddy, but we had no idea!!! Right when we started, a little boy was selling walking sticks (dried bamboo sticks with one end sharpened), and upon seeing a vision of his lovely wife falling straight into a mud puddle, Cory bought one at full price (best 50 cents we ever spent!). So off we went, Chai, the two of us, our walking stick, and 3 women from the village who spoke almost no english (we'll get to them later). The path (if you can call it that!) 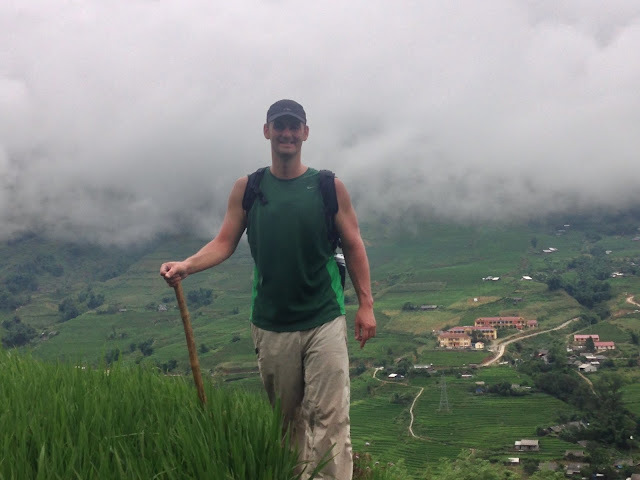 took us through bamboo forests, across the walls of rice paddies (measuring no more than one foot wide! ), up stream beds, through piles of water buffalo dung (or "buffalo chocolate" as the locals call it), over questionably suspended bridges, and through the villages. You realize you haven't really lived until you've slid off a rice paddy wall into ankle deep buffalo chocolate...seriously. This happened to both of us. Maybe it's a sign of good fortune! 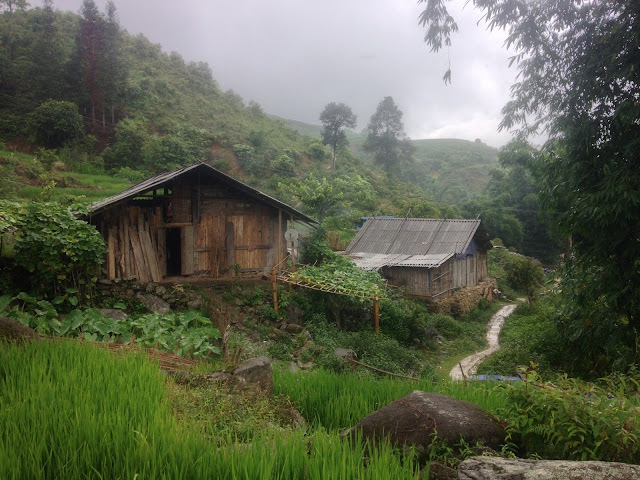 As we left Sapa village to trek into the valley, we were in a pack of other tourists and local Hmong women, which Chai promised would dissipate as we continued into the valley. Soon, it was just the two of us, with Chai and 3 other Hmong women. We assumed they were on their way to their village too, or maybe were there to assist Chai with guiding. We would be wrong. We arrived at lunch, hungry and tired after several hours of trekking, when suddenly the three women opened up the baskets from their back and we were all the sudden in a traveling sales market! And of course we felt like we owed them because they had walked so far. They had a plan, and we were suckers. We bought a little something from them, avoided all the little salesgirls who hadn't followed us for hours, and when we set off again, firmly told the ladies to follow someone else, as we wouldn't be buying. We arrived around 5pm at our homestay which, for lack of a better description, was a barn like structure, with the family's beds and the kitchen on the first floor and rows of beds under mosquito nets for the guests in the barn loft. It was less family-ish and more guesthouse-ish then we were hoping for, so we dug right in to get a more authentic home experience. Cory helped cook dinner over a fire on the kitchen floor (taught by a woman with no English skills) and learned the secret to Vietnamese cooking: a little salt, a little sugar, and a solid dash of MSG. In the morning they served us pancakes, and when I asked if there was any rice, the ladies ushered me inside (no boys allowed) for the best gluten free breakfast I have ever had: rice with sautéed cabbage, pork belly and soup, at a table of 8 Hmong women, getting the morning gossip done. We spent the second day trekking back to Sapa village, after which we were so happy that the village has a plethora of inexpensive foot massage spots! 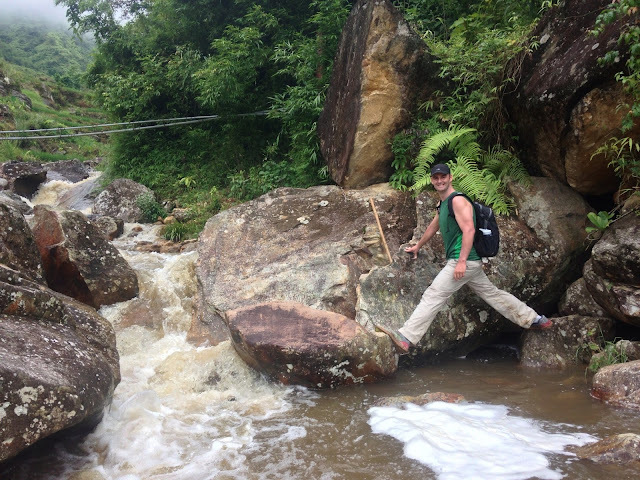 Sapa is best known for hiking into and among the villages and with good reason. The town itself is cute and charming, but overall the food is very expensive and not very good. We had some fun in town, especially having an evening out with our newly engaged Irish friends from the Halong Bay boat, Carl and Maire (congrats, you guys! ), meandering between the valley views, and just relaxing. 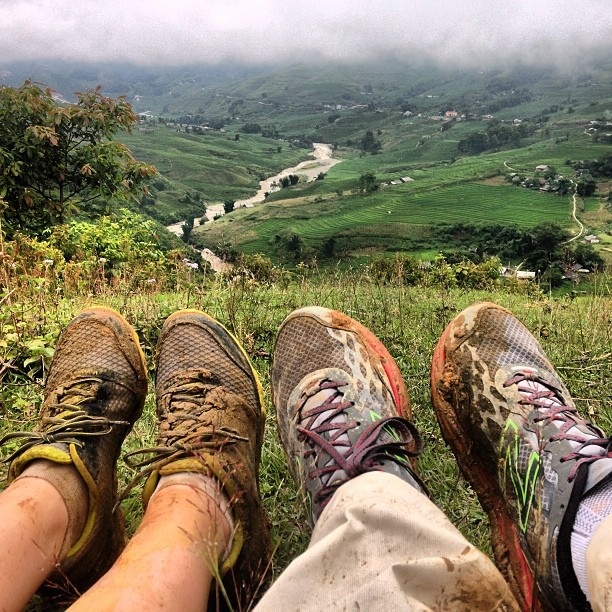 But if you come to Sapa and don't go hiking, I think you've taken a long train for a poor reason! We did have some successes in town. Our hotel, the Sapa Paradise View Hotel was incredible...great value with an owner, Mr. David, who embodies the very definition of incredible customer service (how about surprise banana milkshake delivery after a long day of hiking?). 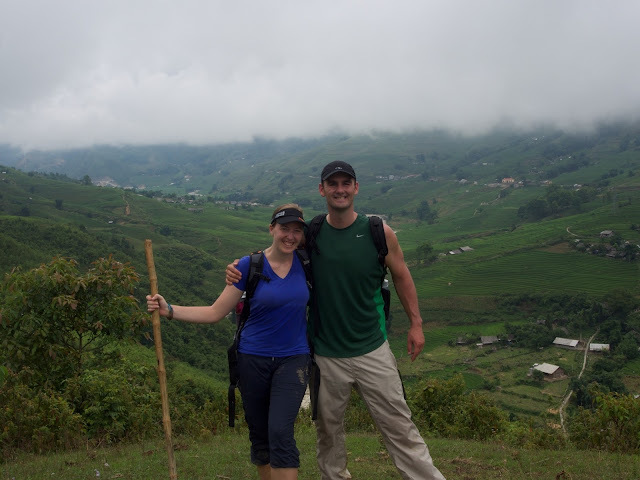 We would absolutely pick the Sapa Paradise View again! For food, keeping to a budget was foremost for us. There are a couple of local restaurants around the corner from our hotel (ordering including walking around the restaurant and pointing to other diners' dishes, as there is zero english spoken), or sharing one set meal and a side of rice is plenty of food and will save some money. Cory and Molly 2013. Travel theme. Theme images by hfng. Powered by Blogger.